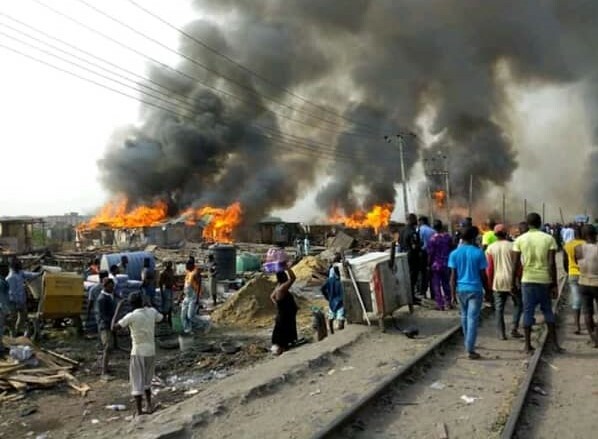 Wednesday, December 12, 2018 turned out to be another black day for residents of Badia-East community in Apapa Local Government Area of Lagos State. The community has been the theater of recurrent evictions that began since the late nineties, effected by public and private actors in the name of urban renewal and real estate development. Another gestapo style invasion and demolition of Badia-East community, perpetrated by heavily-armed security operatives of the Nigerian Police Force, with the tacit connivance of Lagos State authorities, left thousands displaced and traumatized. Over 100 persons, comprising women, the aged, minors, were arrested during the demolitions and were detained beyond constitutional limits at the state’s detention centre at Bolade, Oshodi, Lagos. Armed-to-the-teeth security operatives numbering over 50, invaded the community in the afternoon of Wednesday, December 12, using brutal force and lethal weapons to intimidate and force helpless citizens out of their homes. The demolition crew continued the attack, aided by heavy bulldozers, Black Maria vans and caterpillars. They broke into homes, unannounced, maimed residents who attempted to retrieve their belongings, and finally demolished the entire community, leaving behind rubbles and ruins. With no fewer than 1,000 homes destroyed, women, children and hundreds of families were rendered homeless and their livelihoods wrecked. Not less than 10 persons sustained severe bodily injuries as a result of the brute force and beating they received from the combined forces of security operatives and demolition officials. Days later, the security operatives from Ijora Badia Police Station returned to the community to set the remaining properties ablaze. Specifically on December 17, 24 and 27, battalions of heavily-armed police men stormed the community to burn what was left of the ruins. Residents were threatened to leave the area or ‘get killed’. Through the serial demolition exercises and destructive interventions in Badia-East, Lagos State authorities have inflicted pains, agony on hapless residents, while pushing them deeper into poverty. For a long time now, Badia-East has been thrust into contentious land disputes between various actors, including federal and state agencies, private companies, a chieftaincy family, and the local residents. The competing claims over the ownership of the land is the subject of various lawsuits in Lagos courts. On Monday, December 10, 2018, one such legal action which Badia residents initiated for the enforcement of their fundamental rights came up for hearing at the Lagos State High Court, Igbosere. The defendants, including the Lagos State Government and Commissioner of Police Lagos State were conspicuously absent, only for security operatives to show up in the community two days later to harass, maim and forcefully evict poor residents. There are ample reasons to believe that Badia residents are being targeted because they are poor and helpless. Several communities in Lagos State face security-related challenges amongst other urban problems. When security threats occur in the informal communities like Badia-East, state actors characteristically brand their settlements as havens for criminals. Such negative labels provide state actors with the excuse to invade the community, maim and displace local residents in the name of crime-fighting. But when insecurity is recorded in the highbrow areas of the state, state authorities intervene by beefing up security in those areas, and suddenly suspend the state’s demolition policy. Under national and international law, states bear the responsibility to provide critical public infrastructure, including adequate housing for its citizens. Justifying illegal evictions in the name of insecurity plus the negative labelling of informal settlements are popular strategies often deployed to evade responsibility for decades of governmental neglect and the continuing failure to provide basic amenities that enhance livability. Residents of informal communities like Badia-East, continue to live in abject poverty, without schools, health care and recreational facilities, despite the huge resource allocations and revenues that accrue to the state. A press statement SPACES FOR CHANGE issued on December 14, 2018, called on the Lagos State government and the Nigeria Police Force to halt the persistent attack on the predominantly poor inhabitants of Badia-East. The organization’s legal team took steps to secure the release of hundreds of Badia evictees arrested during the demolitions, and detained for days and weeks without a formal charge in a court of law. SPACES FOR CHANGE also provided humanitarian assistance to the displaced in the form of relief materials to displaced women and children, including medical support to women that were severely beaten and injured during the demolitions. Further legal measures have been initiated in Lagos courts and other quasi-judicial tribunals in the country to secure a restraining order against future evictions in the community, and obtain compensation for the losses. Through SPACES FOR CHANGE’s legal intervention, the remaining evictees in detention have regained their freedom following a sustained legal battle with state authorities at the Lagos State Mobile Court sitting at Oshodi, Lagos. Since 2015, the organization has been providing free legal representation to over 1,000 displaced families in Badia, rendered homeless at the peak of torrential rainfall in September 2015 and June 2017, on the orders of the Ojora Chieftaincy Family, and aided by the bulldozers operated by officials of the Lagos State Government. SPACES FOR CHANGE filed the lawsuits on behalf of the community in July 2016 at the Federal High Court in Lagos, and reinstituted the action at the Lagos State High Court in June 2018 pursuant to a court order. PreviousPrevious post:Kicking Off the New Year with a Strategic Planning SessionNextNext post:Press Release: END THE CRACKDOWN ON CIVIC GROUPS NOW!